I think I may have a slight (okay huge!) addiction to balms...lip balms, cleansing balms, multi purpose balms you name it I love it. So when these two little beauties from Badger dropped on my doorstep lets just say it was love at first sight, that packaging! The Badger Peppermint & Tea Tree Foot Balm and Badger Blue Tansy & Lavender After Sun Balm were completely new to me, so I was very excited to give them a try. The Foot Balm is basically a deeply moisturising balm for very dry neglected feet, perfect for a last minute SOS before holidays. The peppermint really revives and awakens tired feet whilst the essential oils really moisturise the skin deep down. You need to work this in quite well until it absorbs, I love putting it on before bed and popping a pair of socks on to really let it work it's magic overnight. I love the handy size of this, and the smaller tin is really all you need as a small amount really covers the whole foot. Thankfully, I've not really properly had to use the After Sun balm as I haven't been sunburnt, but I did take this away on holiday with me to use on my lips as the sun can really dry my lips out quickly. This worked really well and kept the skin on my lips really hydrated and soothed. This smells really comforting and relaxing as well, so makes a good flying companion for any nervous flyers. The handy size is perfect for travelling or just keeping in your handbag and as with the foot balm, a little goes a long way. 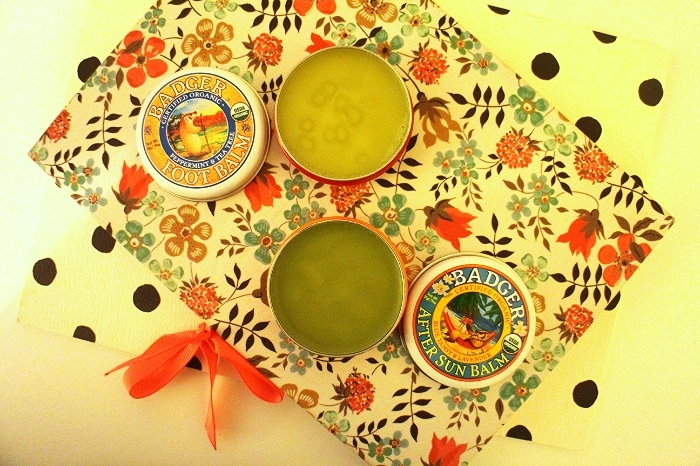 The Badger Foot Balm and Badger After Sun Balm are available online.